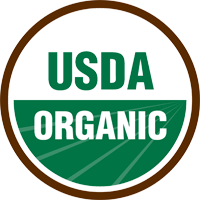 Forever Eden Organics is privileged to currently be the second Personal care and Skincare Company in the State of Maryland to be Certified Organic according to the United States Department of Agriculture (USDA) database. Based on the USDA National Organic Program (NOP) regulations, personal care products are not required to be certified. Forever Eden voluntarily completed the extensive process as a testament and commitment to ensure transparency, integrity and loyalty to Organics for years to come. Every single ingredient inside each Forever Eden product was reviewed and all ingredient vendor sources were verified to be Certified Organic. Not only the ingredients reviewed, but our entire product production process from start to finish. From vendor invoices, storage, sanitation, equipment, labeling, and packaging to the finished product batch identification systems and inventory management. A rigorious inspection performed by The Maryland Department of Agriculture Organic Program staff physically inspected our commercial space, ingredients, packaging, labels and experienced first-hand behind the scenes of our operations. 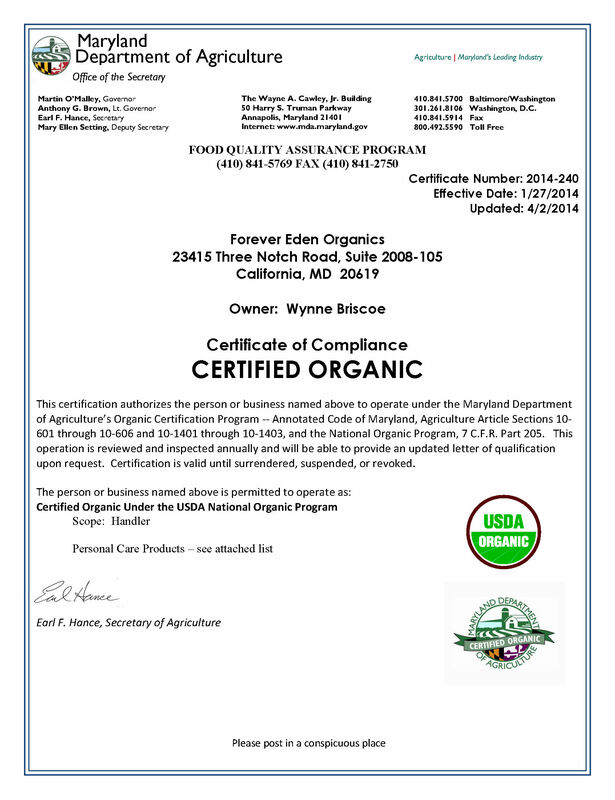 Forever Eden Organics can excitedly say we passed the rigorous processes and on Monday, January 27, 2014 received an Organic Certification from The Maryland Department of Agriculture (MDA). We will be reviewed annually by the MDA to verify we are in compliance with the USDA NOP standards.